The perspective of this shot is what makes it work for me. 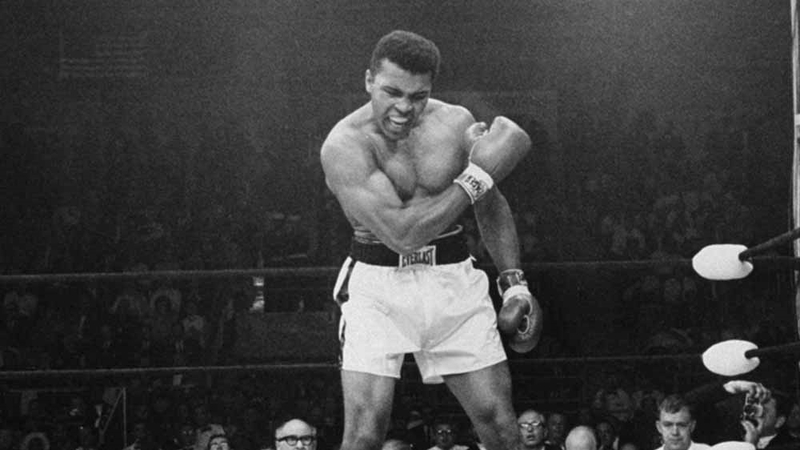 Ali is towering over the photographer, dominating him with his physical presence as well as his verbal tirade. From any other angle this just wouldn’t have the same impact. This photograph was taken ahead of the world title fight in 1971. Frazier is steadfastly trying to ignore his bitter rival but in fact you wonder if he’s imprisoned by Ali’s taunts – a feeling that’s reinforced by the wire meshing which separates the two men. I also love how their eyes don’t meet; it fills the frame with tension. The version of this photograph which made the cover of Sports Illustrated was shot by Richard Meek. But I prefer this picture taken shortly beforehand by Ali’s friend Howard Bingham. It’s just a little more fun. And I like how the security guard is there in the background keeping tabs. In all of the photographs I’ve seen of Ali, I can’t think of any where he looks as supremely toned as this. You can almost see the sinews of his upper body tensing as he prepares to unload a punch. The unusual patchwork of the background lighting, which seems to hang above the ring, is pretty electrifying as well. Ali’s distinctive footwork – the so-called ‘Ali shuffle’ – is rendered cleverly here using multiple exposures. The effect recalls Eadweard Muybridge’s early stop-motion experiments on horses in Palo Alto in the 1870s and his later studies of human models. This is a scene from a party after Clay beat Sonny Liston for the heavyweight title. Such is the power of his celebrity, the assembled crowd are jostling around him simply to watch him eat. The proximity of Malcolm X to Clay serves as a neat metaphor for the closeness of their relationship at that time. Gordon Parks’ shot of Ali after a training session in Miami in 1966 is breathtaking. So much detail, so much contrast and, for once, it’s a portrait of the champion without any hint of braggadocio. 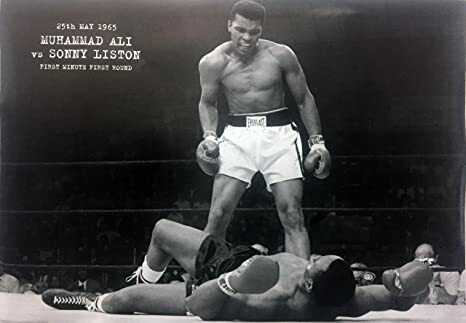 This emotive picture was snapped when Clay beat Liston, who was unable to answer the bell for round seven of their 1964 fight. There are many fine photos of this moment taken head on but in this one I like Clay’s explosive pose and the way his cartwheeling limbs extend towards the corners of the frame. It’s as if he’s about to leap out of it. Muhammad Ali was never shy about lauding his own balletic talents in the boxing ring, and this photograph shows why. His ability to move away from his opponent, Joe Frazier, with such grace makes Frazier’s haymaker look utterly crude. Ali appears to be untouchable. How ironic, then, that Frazier won the contest that was dubbed Fight of The Century. Ali was still known as Cassius Clay when this photo was taken. There’s something boyish about his efforts to impress his audience. I like how one of the women, Ronnie Spector, seems impervious to his bravado. I also like knowing that the guy in the white tuxedo, who is neither overawed nor overshadowed by Clay, is a young Stevie Wonder. I find this image of Ali and Frazier, taken in 2003, to be profoundly melancholic . These two men, who were once so supreme and who shared such a glorious history, appear to have been defeated by age – Frazier especially. 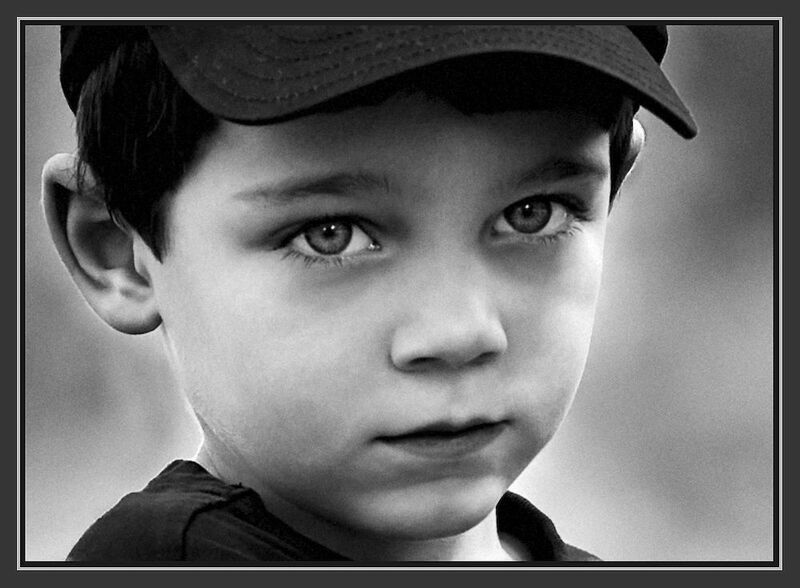 It’s an uncomfortably earnest portrait. The expressions, the simmering contempt, the outfits, the saturated colours – what’s not to love about this image of Ali and George Foreman taken before Ali’s second fight with Jerry Quarry? Ali was 34 by the time this photograph was taken of him and Ken Norton playfully chasing one another across the field at Yankee Stadium. You don’t get fight promotions like this these days. Also, as my colleague pointed out, look at their shoes – what on earth are they wearing those Cuban heels for?! The initial attraction to this shot is, of course, the quirk of the punchbag. 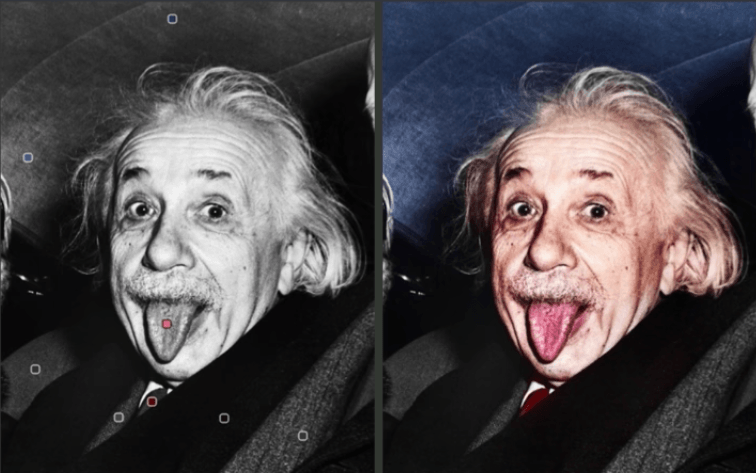 It appears semi-transparent because the photographer has used flash to trap the action in the foreground, while the duration of the overall exposure has rendered the background visible as well. The beautiful silhouettes in the distance behind Ali are critical too. 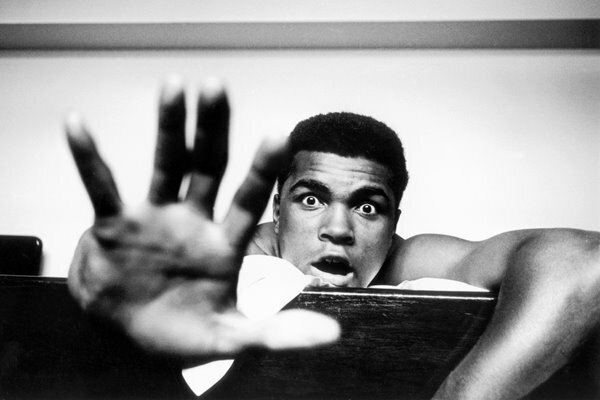 Ali’s capacity to engage with the camera and project himself was extraordinary. A shot like this has the power to make you feel like you’re there in the back of the cab with him. It’s an incidental point, but I also love the car’s interior and the way it frames the shot. 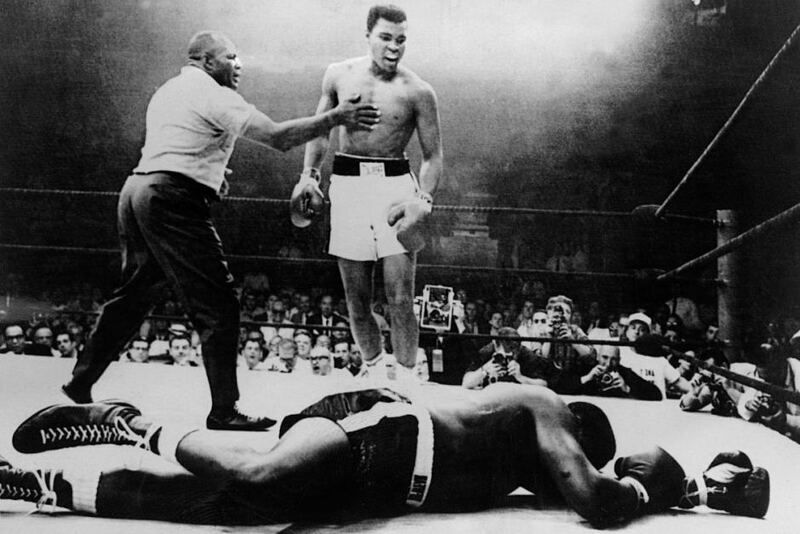 The most famous photo of Ali ever taken is of him standing over Sonny Liston, who appeared to have thrown their 1965 bout. It was taken by Neil Leifer and was shot in colour. Spare a thought then for John Rooney, sat right beside Leifer, who captured this less-acclaimed version. Growing up, I remember buying this one and loving it all the same. This is a great story more so than a great image, but it’s still well worth a mention. Ali had been passing a high-rise building in 1981 when he noticed a commotion; a man was threatening to commit suicide by jumping from the ninth floor. Ali asked the police officers if he could help and duly coaxed the troubled man down from the ledge. The juxtaposition between these two figures is great. Even when hunched over, Ali still dwarfs the comedian and singer Sammy Davis Jr, whom he’s teaching how to box. More than that, though, it’s the kind of photograph which attests to Ali’s character and charm outside the ring. 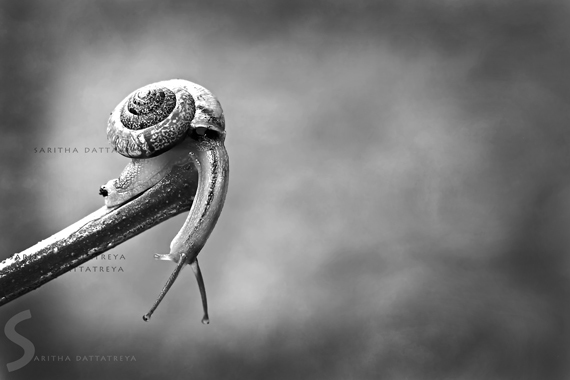 A quick and homespun piece of showmanship which made for a striking photograph. 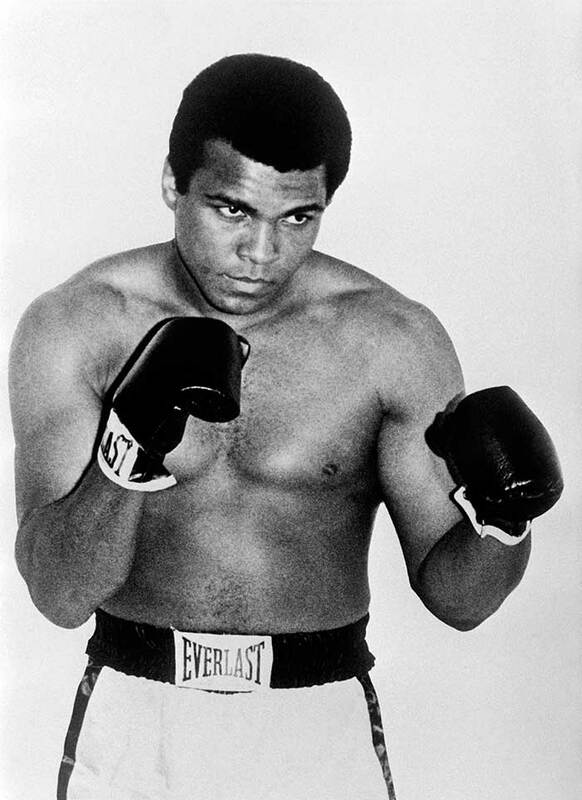 Ali had been accused of being a loud-mouth for always predicting when he would beat his opponents. He needed no words and just two props to fashion a comic response to such criticism. In 2003 this was voted the greatest sport photo ever by the Observer. 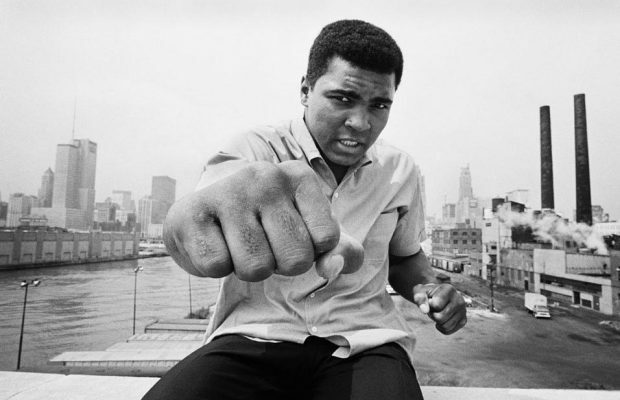 Even Neil Leifer calls it his best shot – one, he says, on which he cannot improve. He’s right. The pristine white canvas is the perfect backdrop, accentuating the two fighters whose figures are so neatly counterposed. I can’t imagine boxing will ever look this sublime again. One of the most celebrated magazine front covers of all time and understandably so. Carl Fischer’s shot for Esquire was the brainchild of art director George Lois. The reference to St Sebastian speaks of Ali’s persecution following his refusal to fight in the Vietnam war. Sticking the arrows on to Ali’s body was a nightmare, Fischer told me; the arrows had to be strung up using fishing wire because they kept falling down. In dumping George Foreman to the canvas in ‘The Rumble in the Jungle’, Ali reclaimed the heavyweight title after his long suspension for refusing to be drafted into the US Army. Admittedly boxers never look pretty when they’re going down, but Foreman looks like a giant tree that’s been felled. This shot witnesses a pre-fight scene where Ali is poised with anticipation. His outline is so distinctive – it reminds me of the famed image of Ali underwater by Flip Schulke. Notice, also, the shadowy figure in the toilet behind Ali; at first I questioned whether he spoiled Ali’s solitude, but I grew to like the subtle detail of their twinning. 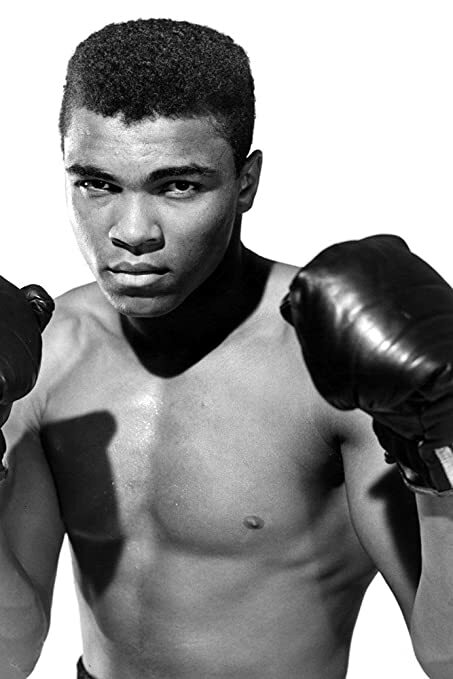 Clay was just 18 when he won Olympic gold in 1960 in the light heavyweight category. Just look how callow he appears, particularly in comparison to the guys to his left and right, who look like 40-year-old bricklayers in comparison.